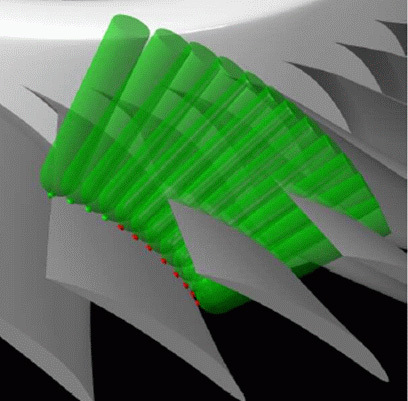 We introduce a new approach to the problem of collision detection in multi-axis NC-machining. 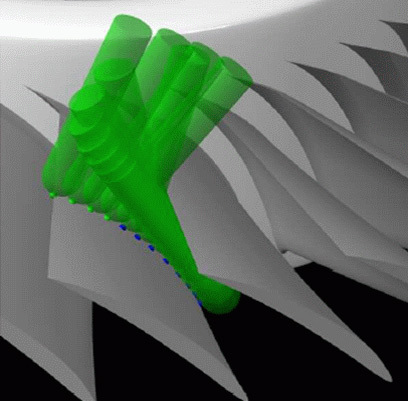 Due to the directional nature (tool axis) of multi-axis NC-machining, space subdivision techniques are adopted from ray-tracing algorithms and are extended to suit the peculiarities of the problem in hand. We exploit the axial-symmetry inherent in the tool's rotational motion to derive a precise (to within machine precision) polygon-tool intersection algorithm which, combined with the proper data structure, also yields efficient computation times. Other advantages of the proposed method is the separation of the entire computation into a preprocessing stage that is executed only once, allowing more than one toolpath to be efficiently verified thereafter, and the introduced ability to test for collisions against arbitrary shaped tools such as flat-end or ball-end, or even test for interference with the tool holder or other parts of the NC-machine. Support for continuous analysis along the tools path is also possible. The image on the left presents a 5-axes tool path that was analyzed, intersections detected, and corrected by rotating the ball end tool's orientation. This work considers computation of visibility for two-dimensional shapes whose boundaries are C^1 continuous curves. We assume we are given a one-parameter family of candidate viewpoints, which may be interior or exterior to the object, and at finite or infinite locations. We consider how to compute whether the whole boundary of the shape is visible from some finite set of viewpoints taken from this family, and if so, how to compute a minimal set of such viewpoints. The viewpoint families we can handle include (i) the set of viewing directions from infinity, (ii) viewpoints on a circle located outside the object (for inspection from a turntable), and (iii) viewpoints located on the walls of the shape itself. We compute a structure called a visibility chart, which simultaneously encodes the visible part of the shape's boundary from every view in the family. Using such a visibility chart, finding a minimal set of viewpoints reduces to the set-covering problem over the reals. Practical algorithms are obtained by a discrete sampling of the visibility chart. For exterior visibility problems, a reasonable approach is to compute an almost-optimal solution (in terms of number of viewpoints), which can be done in almost-linear time. For interior visibility problems, or when a more correct solution is required, we solve the general set-covering problem, guaranteeing an optimal solution but taking exponential time. In either case, conservative solutions are obtained, ensuring that no part of the curve remains invisible from some viewpoint. Examples are given to illustrate our algorithm. The presented image shows (from left to right) the visible portion (in yellow) of the curve from one view, the visibility chart in the middle, and the three views that covers the entire domain (right). These three views could be used to create a 2D mold of 3 pieces. This work presents a precise approach to the generation of optimized collision-free and gouging-free tool paths for 5-axis CNC machining of freeform NURBS surfaces using flat-end and rounded-end (bull nose) tools having cylindrical shank. To achieve high approximation quality, we employ analysis of hyper-osculating circles (HOCs) (Wang et al., 1993a,b), that have third order contact with the target surface, and lead to a locally collision-free configuration between the tool and the target surface. At locations where an HOC is not possible, we aim at a double tangential contact among the tool and the target surface, and use it as a bridge between the feasible HOC tool paths. We formulate all such possible two-contact configurations as systems of algebraic constraints and solve them. For all feasible HOCs and two-contact configurations, we perform a global optimization to find the tool path that maximizes the approximation quality of the machining, while being gouge-free and possibly satisfying constraints on the tool tilt and the tool acceleration. We demonstrate the effectiveness of our approach via several experimental results. This work presents an efficient algorithm for generating a continuous precise contact motion between planar geometric models bounded by piecewise polynomial C^1-continuous parametric B-spline curves. A system of algebraic constraint equations is formulated and then efficiently solved for the two/three-contact configuration between two planar B-spline curves. The result is essentially the same as the generation of configuration space obstacle for a moving curve (with translation and rotation) against a stationary curve. The two-contact motion can be characterized as the intersection curve in the boundary of the configuration space obstacle. The topology of the reconstructed solution is guaranteed to be correct up to a prescribed tolerance and we demonstrate the effectiveness of the proposed approach using several test examples of continuous contact motion among planar freeform smooth geometric models. In additive manufacturing (AM), slicing is typically used to manufacture 3D models, one layer after another. Yet, in recent years quite a few hardware platforms were introduced toward the use of multi-axes AM with general 3D curves as print-paths. This paper presents algorithms for the generation of such general print-paths that can potentially be used to synthesize superior 3D models using AM. In slicing, a 3D model is decomposed into a series of parallel planar sections, which in turn are (usually) decomposed into a set of piecewise linear curves used as print-paths in the AM process. The methods we propose in this work ease this restriction, namely the print-paths are no longer limited to parallel planes. Like slicing, the methods we propose achieve a complete covering of a general volume with print-paths expressed as general curves. 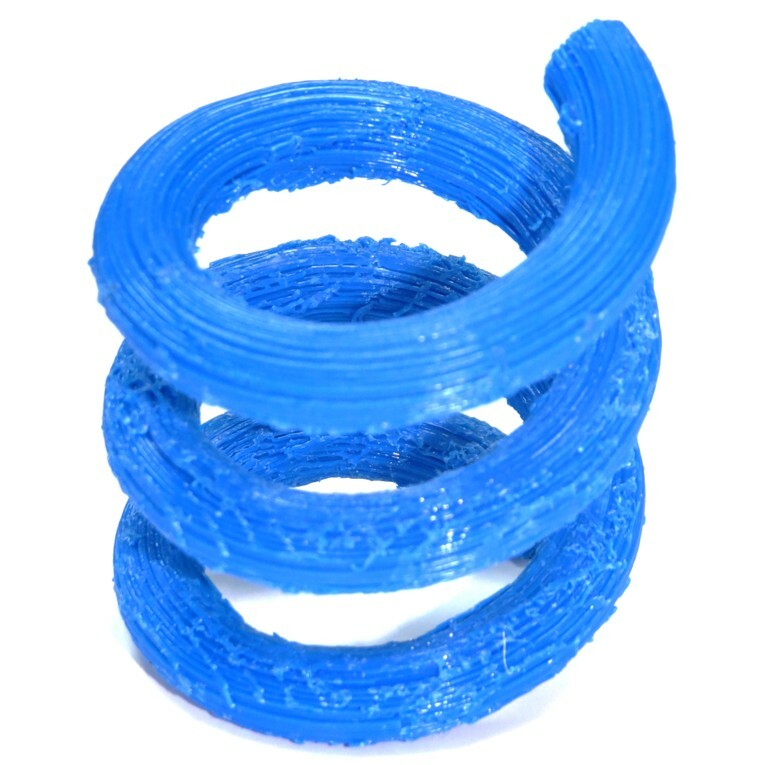 However, and unlike slicing, the created print-paths can conform better to the 3D model, its properties, and even user input. We expect that the added flexibility and freedom in the specification of AM print-paths, as opposed to limiting them to planar curves, will enable the synthesis of 3D models (using AM) with superior properties (such as mechanical strength and surface finish). As a proof of concept, we also present examples of 3D models manufactured with a low-end AM hardware and using the algorithms described in this paper. This work shows how freeform volumetric models can be used in the fabrication of functionally graded material objects, using additive manufacturing. 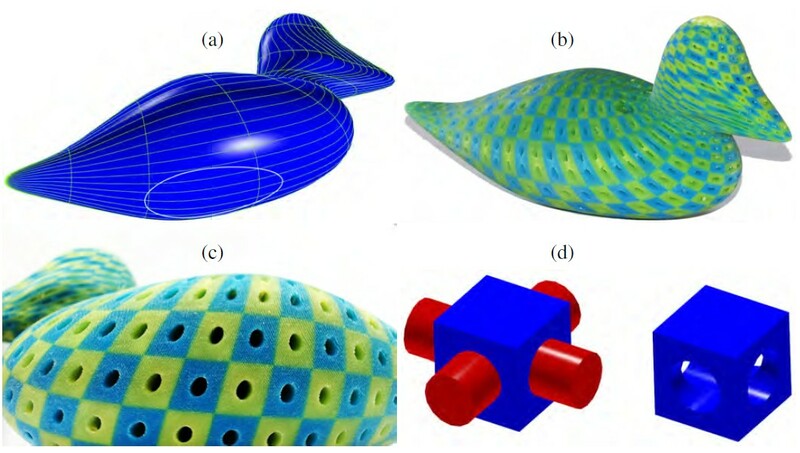 Freeform design models are constructed as complexes of trimmed parametric trivariate volumetric cells that specify both the geometry and material composition of objects. We present efficient methods that allow the fabrication of general volumetric freeform designs, following the modeling generality of contemporary B-rep geometric modeling systems, using multi-material 3D printers. Our methods allow the application of any material function to the volume of a model, from simply another (possibly trimmed) trivariate function, through a volumetric discrete texture to a procedural function. We complete this work by demonstrating these introduced capabilities toward the fabrication of functionally graded material objects, using a modern multi-material 3D printer. In this paper, we present a method for generating smooth 5-axis tool-paths for computer numerical control (CNC) machining, that are assured to be globally accessible. We do so, for a given ball-end cutter and cutter contact curve, and a general arrangement of model and obstacle freeform surfaces. The proposed method is based on a conservative computation of accessibility for (small) finite surface and orientation elements. A conservative estimate ensures the correctness of the solution, and allows us to define a continuous accessible volume in the tool's configuration space. This global accessibility volume, in turn, allows us to plan an accessible tool-path, and optimize it globally. The conservative approach we use allows accessibility computations to be made for an entire cutter contact curve, eliminating the need to compute accessibility for individual cutter contact points, along with the shortcomings that such a sampling approach would introduce. We present examples using the proposed method, that turns paths specified on the surface (cutter contact curves) into valid 5-axis tool-paths with orientation information. We also present results using a CNC machining simulation software, validating the proposed approach and demonstrating realistic manufacturing processes using the proposed methods.